I guess he came to see my neighbors, Ken and Ro, who are sculptors. But perhaps they weren't home! If that dog wants to come in I'm not going to argue with him!!! Great shot. Its a very bust meeting place right i the centre of town...more people pictures from there soon. 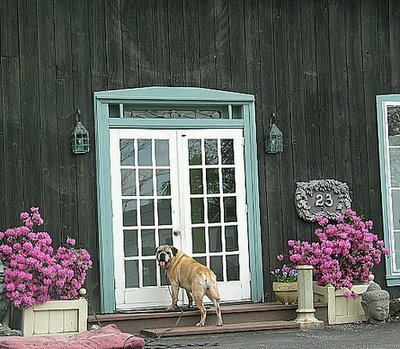 How lovely..I love the flowers on both sides of door the colors are great,seems like a very lovely house...Have a great sunday..
Nice front door. Love the flowers. What a lovely house! The color scheme is great!